well, lets go ultimate. lets get serious. i want the z-tune! it uses N1 rb26dett block, bored and stroked to 2.8 L (87.0 x 77.7 mm), producing 510bhp, and 540nm of torque. now thats a serious machine. The RB26DETT N1 is a modified version of the RB26DETT engine, developed by Nismo (Nissan Motorsports) for Group A and Group N motorsport. Nismo found that the standard RB26DETT engine required too much maintenance for use in a Group-A or Group-N race car and subsequently designed the N1 block. This was first used in Bathurst Australia. Nismo balanced the crankshaft to a higher specification than stock, as the RB26DETT engine experiences vibrations between 7000 and 8000 rpm. The engine also received improved water and oil channels within the engine block. The pistons and top piston rings were also upgraded to 1.2 mm. The N1 engine also has upgraded camshafts and upgraded turbochargers. Although all versions of the RB26DETT N1 engine use Garrett T25 turbochargers, the specification of the turbochargers changed through the 3 generations of the RB26DETT N1 engine (R32, R33, and R34). The R32, and R33 versions used Journal Bearing T25 Turbochargers. The R34 RB26DETT N1 engine used Garrett GT25 turbo chargers (which use a set of ball bearings). The biggest difference between the turbochargers used in the N1 engine, and the standard RB26DETT engine, is that the turbine wheels in the turbocharger are made from steel, rather than the ceramic used for the standard RB26DETT turbochargers. The ceramic turbine wheels are found to be very unreliable when used at high rotational speeds inducing higher centrifugal forces (such as when the turbochargers are used at a higher boost pressure than stock). With the advances in manufacturing technology such as sealing and material processes. The N1 engine is theoretically said that when fuel and boost levels are modified, it is able to produce (and handle) in excess of 1,900 bhp (1,400 kW) without any modification to the engine block or rotating assembly. The Nismo RB26DETT N1 engine block uses an 86 mm bore which can be bored up to either 87 mm or 88& mm. The N1 block is stamped with an identification mark of 24U, whereas the standard RB26DETT block is marked with 05U. The RB26DETT N1 block is compatible with all GT-R engine bays. This is the engine used in the Nissan Skyline GT-R Z-Tune built by Nismo. It uses the stronger RB26 N-1 block, modified with Nismo parts, bored and stroked to 2.8 L (87.0 x 77.7 mm). The end result was the RB28Z2, which produces 510 bhp (368 kW) and 540 N·m of torque. 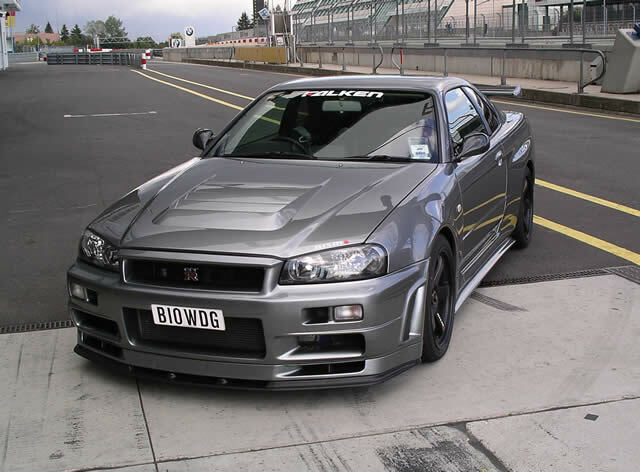 Nismo originally designed the concept of the Z-tune in 2002 when Nissan was putting an end to the R34 Skyline production. The first Z-tune was built in 2003, using a used 2002 Skyline GT-R V-Spec II. It was built with a concept RB26DETT 'Z1' engine. This engine was based on Nissan's Le Mans GT2 and GT500 racing experiences. As with the racing vehicles a strengthened engine block and stroked crankshaft were utilized. The engine was also bored. With the new displacement of 2.8L and upgraded turbo-chargers the Z1 produced 370 kW (500 hp). The Z-Tune had a 0–100 km/h (0–60 mph) time in 3.8 seconds and has a top speed of over 203 mph. Nismo was then given the approval from Nissan to build Z-tune models for the Nismo anniversary. Nismo then purchased 20 used R34 GT-R V-Specs, each with less than 18,000 miles (29,000 km) on the clock, they were then completely stripped and were resprayed to a "Z-tune Silver," a special color exclusively for the Z-tune. For each of the 20 production models, the 2.8L engine was revised to allow it to reach 8000 rpm. The turbochargers were supplied by IHI in Japan. The engine is advertised as making as much as 370 kW (500 hp) (for warranty reasons). This second revision of the Z-tune engine is called the 'Z2'. The bodywork is designed with the same functional components used in Nismo's GT500 racing cars, such as engine bay vents on the hood and fenders, as well as wider fenders for wider wheels. The Z-tune is also improved with an aggressive suspension setup from Sachs, and a specially designed Brembo e brake system. We need some Nissan power!